Let's start talking about the tiny house, shall we? I know that's the reason some of you continue to read this blog. Camper life has been going so well at the moment that we may have forgotten at a time or two that we wanted to get out of it! But then we remember, oh wait! We live in 140-square-feet, and with a dog, too! We must be crazy, right? We have found ways to make our living situation work right now, but we know that it might not always be what we're looking for in the future. So with that, it's time to start taking action on the tiny house! It doesn't get much better than planning out the space you're going to be living in. But for some reason, I thought this would be an afterthought. Like, maybe we'd buy the trailer and the materials and just kinda make something out of it. If you're a planner, you will want to spend lots of time sketching out everything you want in your space. Notice how I said "need" and not "want." Tiny house dwellers might "want" more space, but they are living small because they are intentionally using space efficiently. To get an idea of square footage, stop by your local camper or RV store and walk on different sized trailers. Find an empty parking lot and use a measuring stick to draw the outline of your house. As you walk from room to room, think about whether or not you could live in that space. Do you want standard living features? I'm talking about a bedroom, kitchen, living area, etc. And in those areas, do you want the same appliances that you might find in your family's or friends' homes? Do you need a dishwasher or a washer/dryer? Are they necessary? Can you hide features or use space in multifunctional ways? Design your house in ways to accommodate the features you need, because sometimes these features can take up more space than you thought. How many people can you fit in your home? If you're not too keen on guests, you might as well just have a loft or a pull-out couch as your sleeping option. But if you like to entertain, it's important to know the maximum number of people your house can sleep and how big of a table you can fit in your "living room" ... or should I say your "multifunctional space." Having a place to lay out an air mattress could come in handy when the other sleeping options are taken. Can everyone use your space? We knew we wanted to sleep in a loft, but we had to ask ourselves if our dog, Blaize, was allowed up there too. If so, she might not be coming up on a ladder. The stairs vs. ladder conversation is a good one to have. If you go the stairs route, make sure you can design them so they aren't too narrow to navigate. If you have elderly family members, you may want to consider where they will be sleeping when they come to visit as well. Will they be using a ladder or stairs to get to a sleeping loft or can they sleep on the main level? Will it still be liveable in the future? Just because you're not ready to have children yet, doesn't mean you shouldn't talk about them. If there's a chance your family is growing in size in the future, you may want to design around their inevitable expectations. If you're only planning on living in your home for 5-10 years, then you may have to ask yourself deep questions about the purpose of the project. If it's a temporary home, is it worth the time and cost? If it's a long-term home, will a small home still feel comfortable in the future? Unless your degree is in architecture or engineering (or perhaps you have some construction experience), you may be clueless as to how to begin to build a house. If you know how to learn, you can pretty much learn anything you need to know! The Internet has helped level the playing field and allows everyone to explore areas they never would have before. Thanks to social media connections, I have read plenty of articles about what NOT to do. Reading "Of mistake making and taking my ceiling apart…" by Ella Harp helped me realize the importance of venting a roof. Boy was she peeved with all the work she was going to have to do to replace it! Don't make other people's mistakes if you can help it. Where can you find inspiration? I found a post recently on Living Big in a Tiny House's Facebook page, "12 Beautiful & Creative Tiny House Lofts." It's nice to get an idea of what your options might be by looking at what other people have done already. These kind of images open up questions about flat or sloped roofs, skylights, window designs, etc. If you're going to invest a lot of time designing your tiny house, make it your own! You can benefit from coming up with your own ways to make it work for you. If you have special hobbies or passions, try to incorporate them into your design elements or add space in the design of your new tiny home so you can continue to explore them. Start sketching! Use a paper and pencil and start to draw out what your home might look like. When you have a sketch that you are somewhat happy with, use a computer program to get an idea of exact spacing and size constraints. Feel free to pass your sketch along to your friends and family for feedback. Better yet, show a tiny house dweller your work and see if they would change anything. The EPA says the average American spend 93% of their life indoors. I'm going to let you digest that for a second. That's a lot! Even though I'm a proponent of more time outside than inside (if you can), it's still crucial to consider sustainable design. For example, southern facing windows reduces your energy bill, while giving you a healthy living space. Ask yourself all the tough questions before you get too far along in the process and take your time! Rome wasn't built in a day, right? This is where we're at so far! Designing the tiny house in our tiny house! How about 'dem apples? It's no secret that we're pretty new to this tiny living thing. In the last few months, we have learned that it pays to be creative in how you use space, where you store things and how to keep warm in the wintertime. It doesn't matter how big your car is, it's a great resource for storing items that may not fit in your tiny home. She's called Smokey because she's not so good for the environment but she also can smoke most cars her size on mountain drives. Since I am using a local gym or yoga studio as my shower and dressing room, it's been nice to have extra towels and toiletries in my car in case I forget something. Pat yourself on the back when you find an extra pair of shoes or some snack items in your car when you don't have time to run home. Running out of shampoo, conditioner or body wash? Taking a drop-in yoga or other workout class may work in your favor. I go to a yoga studio a few times a week to refill liquids for my toiletry bottles, stock up on Q-tips or mouthwash. I try to use organic or biodegradable products, so I only try to do this when I may not have time to run to the store. On an everyday basis, having everything you need in one spot will most likely lower your stress level in the long run. Who is that crazy bag lady? Yeah, I'm not with her. Before purchasing a new gym bag, I would sometimes carry three or four bags with me just to go to shower. Instead of working harder to make sure you grabbed everything you need, let the bag do the work for you. For me, I knew I needed a bag with several compartments (one that separated workout clothes from professional clothes), a place for my yoga mat and water bottle and one that could also double as a traveling bag for road trips. After extensive research, I found a great one at REI. Now that I don't use my backpacking pack anymore as my storage bag, I no longer look like I'm taking an epic hike to work in the morning. It's hard to see (but that's kind of the point!). A few jewelry pieces are stored inside my purse. You may think they'd get tangled up in there, but so far so good! Every night before I go to bed, I take off my jewelry that I wore that day. I used to put it in the bathroom, but what I found was that I would forget it because I wasn't getting ready in there in the mornings. Now I place my jewelry in a zipper in my purse and put it on when I get to work. I also keep phone chargers and extra hair ties in my purse as well. Along those lines, a yoga studio or a nicer gym for a day can feel like you're on cloud 9. That may seem crazy, I know, but when you don't use high-pressurized showers or have access to toiletries and amenities, it can feel luxurious. It's nice to leave some of your toiletries at home because the local gym or studio will provide it all for you. We have a mini fridge/freezer in the camper trailer and often we run out of room for food storage. The fall is a perfect time to use a cooler as food storage. Place it outside your home at night and grab it in the morning. Just make sure to remember to refreeze the ice packs between long uses. I thought Greg was a tad bit crazy for this one. One day I walked into the camper trailer and there were piles of rocks and jugs of water placed all over the floor. One hundred and forty square feet is tight enough and now we have all this other stuff to step over? Are you kidding me? Turns out rocks and water absorb heat from an area and will release it slowly when they cool down. Who knew? Blaize is the best little spoon around. Sorry Greg! The coolest part about this trick is that you can feel like you're camping, but instead of being too cold, you're tucked inside your tiny home. Use a sleeping bag for some extra padding or as a blanket on colder nights. Pets make great electric blankets. Grab your furry friend and cuddle up. It's much cheaper than buying an electric blanket. 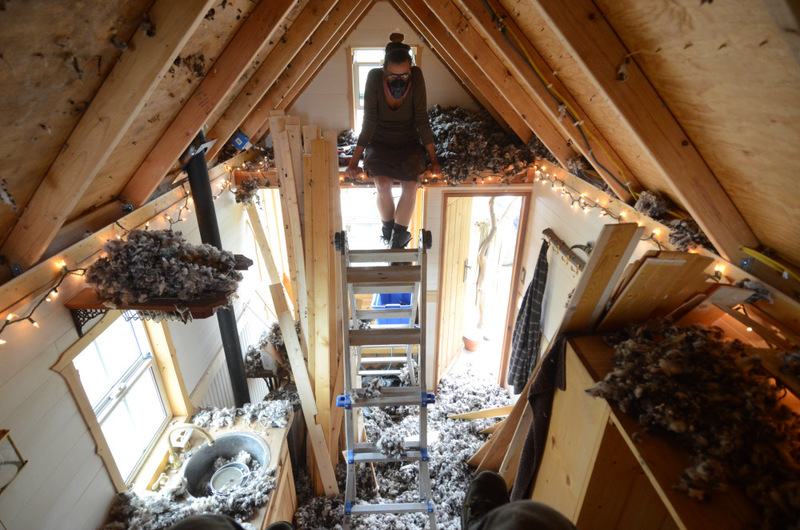 You may not want to run a space heater all day to keep your tiny house warm while you're gone. Schedule an electric timer to turn on a heater for you while you're gone so that your house gets toasty just a few hours before you return. If you have more than one space heater, timers are a great way to coordinate different heaters so they distribute the temperature in different areas and keep your pipes from freezing. With extra insulation, it can be quite dark in the mornings. Trying to wake up can be rough. Setting a timer for lights to go on when your alarm goes off is a great way to help wake yourself up. Yep, you heard the guy. Apparently, he has a sock problem. After wearing a pair of socks to the gym, he sometimes can't remember if it's fresh pair or if it's a pair that needs to be washed. So what does he do? He ties his socks in "knots" to indicate that he should not wear them until he washes them. That way if he stumbles across a few socks in his gym bag, he knows which ones are clean. To this I say, just toss your dirty pairs in the laundry hamper! But, I have to say I laugh every time I stumble across a pair of socks tied in a knot. It's about the same humor to me as finding a sock on the door. Greg, you win for your crazy sock tip!